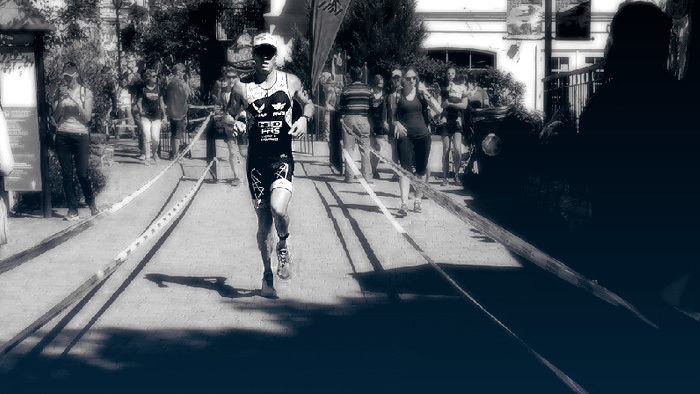 At the 2014 IRONMAN 70.3 World Championships in Mont Tremblant, Quebec, age group athlete Brad Williams posted the fifth fastest bike and ninth fastest run on his way to finishing ninth in the 25 to 29 age group and 51st overall. His strong but controlled effort on the bike set him up for a solid run, the perfect plan for achieving such a great result. Here is a look at Williams’ bike and run data. Click here to view Williams’ full bike file. After a 27:52 swim that left Williams behind the leaders of his age group, he set to work reeling them in. His first 10 miles were done at a Normalized Power® (NP®) of 298 watts. With a Functional Threshold Power (FTP), set at 340 watts, that means that Williams rode at an Intensity Factor® (IF®) of .88, or 88 percent of his FTP. While that is a bit high, Williams dialed it back a bit and settled into a rhythm. For the first 28 miles of the bike, Williams averaged 278 watts, or 3.69 watts/kg. The 994 ft. of rolling elevation gain in the first half, made it difficult to keep a steady power output, but Williams was able to hold a Variability Index (VI) of 1.05, right at the high end of what we typically see. To do this, he kept his power under control on the climbs and continued pedaling hard on the downhills. During a 2 minute section where Williams was descending he averaged 37mph and averaged 215 watts with no coasting at all. The second half of the course featured 500 more ft. of elevation gain than the first 28 miles. On a course like Mont Tremblant, where the back half is harder than the first, any pacing mistake is greatly magnified. Go too hard in the first miles and you’ll be out of gas for the final miles. Over the last half of the bike Williams averaged 281 watts, three more watts than the first 28 miles. As much a product of the extra climbing, this is a product of Williams’ smart pacing early on. Amazingly, despite the extra elevation gain and fatigue, Williams lowered his VI to 1.04, meaning his power output was steady over the last half. Over the full 56 miles, Williams averaged 280 watts, or 3.71 w/kg, which is a very strong number for any male athlete. His IF ended up at .86, which is OK for an elite age grouper or pro male athlete. For the average age grouper, an IF of .80 or less is a better target to shoot for. Click here to view Williams’ full run file. Coming off a strong bike, Williams still had to close with a strong run. The two loop run course at Mont Tremblant was similar to the bike with rolling hills punctuated by a few steeper sections. Like the bike, steady and even is the most effective way to pace the run. Normalized Graded Pace, (NGP) takes the elevation gain and loss into account to show what an athlete’s pace would have been given the same effort over a flat course. During the run, Williams’ NGP was 6:15 per mile for the first 6.5 miles. During this same stretch, Williams’ heart rate stayed relatively steady. Coming out of T2 his heart rate was at 131bpm, peaked at 161bpm at the top of a climb at the 6.25 mile mark, and averaged 149bpm. Over the last half of the race and headed to the finish line, Williams pushed hard. He dropped his NGP to 6:11 per mile and had an average heart rate of 155bpm. He ended up posting a 13.1 mile run of 1:23:24, the ninth fastest of his age group. Negative splitting a hard hilly run is a testament not just to the level of fitness Williams had, but also to his ability to pace the bike and run smartly. Race day is not just about how fit you are, it is also about creating and executing a smart plan. Williams was in peak condition and executed well on race day, leading to an excellent result. AJ Johnson is the Content Editor and Power Analyst for TrainingPeaks. He is also a USA Triathlon and USA Cycling certified coach. A jack of all trades in endurance sports, he has raced everything from IRONMAN and marathons to road, mountain, and track cycling. A former freelance writer and editor of TRI and ROAD Magazines, when not editing or writing he spends his time with his family or out on long rides to think of more great content for TrainingPeaks readers.